For the film of this name, see Logistics (film). For the musician, see Logistics (musician). 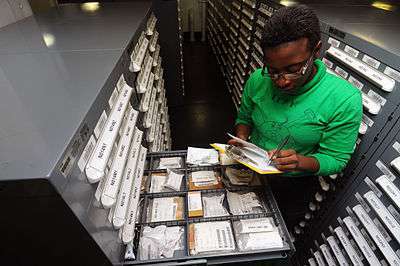 Logistics Specialist inventories supplies in a storeroom aboard the aircraft carrier USS George H.W. Bush, where inventorying means making a report on stock availability. Notice how every stock keeping unit has an individual code and a code corresponding to a specific subclass from a given drawer. The prevalent view is that the term logistics comes from the late 19th century: from French logistique (loger means to lodge) and was first used by Baron de Jomini. Others attribute a Greek origin to the word: λόγος, meaning reason or speech; λογιστικός, meaning accountant or responsible for counting. The Oxford English Dictionary defines logistics as "the branch of military science relating to procuring, maintaining and transporting material, personnel and facilities". However, the New Oxford American Dictionary defines logistics as "the detailed coordination of a complex operation involving many people, facilities, or supplies," and the Oxford Dictionary on-line defines it as "the detailed organization and implementation of a complex operation". As such, logistics is commonly seen as a branch of engineering that creates "people systems" rather than "machine systems." Academics and practitioners traditionally refer to the terms operations or production management when referring to physical transformations taking place in a single business location (factory, restaurant or even bank clerking) and reserve the term logistics for activities related to distribution, that is, moving products on the territory. Managing a distribution center is seen, therefore, as pertaining to the realm of logistics since, while in theory the products made by a factory are ready for consumption they still need to be moved along the distribution network according to some logic, and the distribution center aggregates and processes orders coming from different areas of the territory. That being said, from a modeling perspective, there are similarities between operations management and logistics, and companies sometimes use hybrid professionals, with for ex. "Director of Operations" or "Logistics Officer" working on similar problems. Furthermore, the term supply chain management originally refers to, among other issues, having an integrated vision in of both production and logistics from point of origin to point of production. All these terms may suffer from semantic change as a side effect of advertising. Inbound logistics is one of the primary processes of logistics, concentrating on purchasing and arranging the inbound movement of materials, parts, and/or finished inventory from suppliers to manufacturing or assembly plants, warehouses, or retail stores. Loading of a thermal oxidizer at the point of origin en route to a manufacturing plant. Construction Logistics is known to mankind since ancient times. As the various human civilizations tried to build the best possible works of construction for living and protection. Now the construction logistics emerged as vital part of construction. In the past few years construction logistics has emerged as a different field of knowledge and study with in the subject of supply chain management and logistics. 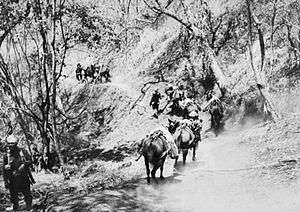 Punjab Regiment uses mules for carrying cargo in Burma during WWII. Animals have been used for logistic purposes by different people throughout history, the Roman army in particular preferred mules over donkeys for their moving capacity. In military science, maintaining one's supply lines while disrupting those of the enemy is a crucial—some would say the most crucial—element of military strategy, since an armed force without resources and transportation is defenseless. The historical leaders Hannibal, Alexander the Great, and the Duke of Wellington are considered to have been logistical geniuses: Alexander's expedition, the longest military campaign ever undertaken, benefited consiberably from his meticulous attention to the provisioning of his army, Hannibal is credited to have "taught logistics" to the Romans during the Punic Wars  and the success of the Anglo-Portuguese army in the Peninsula War was the due to the effectiveness of Wellington's supply system, despite the numerical disadvantage. The defeat of the British in the American War of Independence and the defeat of the Axis in the African theater of World War II are attributed by some scholars to logistical failures. Military have a significant need for logistics solutions and so have developed advanced implementations. Integrated Logistics Support (ILS) is a discipline used in military industries to ensure an easily supportable system with a robust customer service (logistic) concept at the lowest cost and in line with (often high) reliability, availability, maintainability, and other requirements, as defined for the project. A forklift stacking a logistics provider's warehouse of goods on pallets. 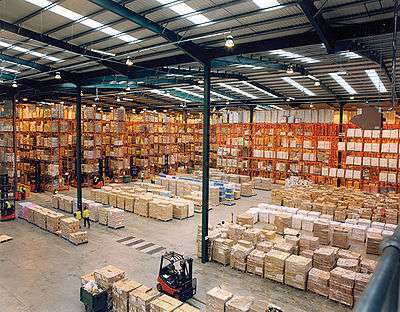 A depot or deposit is a standard type of warehouse thought for storing merchandise (high level of inventory). 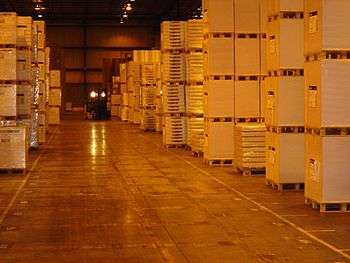 Distribution centers are for order processing and order fulfillment (lower level of inventory) and also for receiving returning items from clients. Transit points are built for cross docking activities, which consist in reassembling cargo units based on deliveries scheduled (only moving merchandise). Traditional retail stores of the Mom and Pop variety, modern supermarkets, hypermarkets, discount stores or also voluntary chains, consumer cooperative, groups of consumer with collective buying power. Note that subsidiaries will be mostly owned by another company and franchisers, although using other company brands, actually own the point of sale. Unit loads for transportation of luggage at the airport, in this case the unit load has protective function. Handling systems include: trans-pallet handlers, counterweight handler, retractable mast handler, bilateral handlers, trilateral handlers, AGV and stacker handlers. Storage systems include: pile stocking, cell racks (either static or movable), cantilever racks and gravity racks. 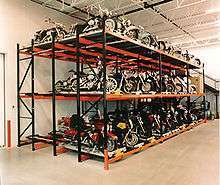 Push-Back rack for motorcycles, a LIFO rack system for storage. Regarding a single warehouse, besides the issue of designing and building the warehouse, configuration means solving a number of interrelated technical-economic problems: dimensioning rack cells, choosing a palletizing method (manual or through robots), rack dimensioning and design, number of racks, number and typology of retrieval systems (e.g. stacker cranes). Some important constraints have to be satisfied: fork and load beams resistance to bending and proper placement of sprinklers. Although picking is more of a tactical planning decision than a configuration problem, it is important to take it into account when deciding the racks layout inside the warehouse and buying tools such as handlers and motorized carts since once those decisions are taken they will work as constraints when managing the warehouse, same reasoning for sorting when designing the conveyor system and/or installing automatic dispensers. Airline logistic network. Note how Denver works as hub in the network. Horizontal business alliances often occur between logistics service providers, i.e., the cooperation between two or more logistics companies that are potentially competing. In a horizontal alliance, these partners can benefit twofold. On one hand, they can "access tangible resources which are directly exploitable." In this example extending common transportation networks, their warehouse infrastructure and the ability to provide more complex service packages can be achieved by combining resources. On the other hand, partners can "access intangible resources, which are not directly exploitable." This typically includes know-how and information and, in turn, innovation. Industrial machinery can typically identify products through either Bar Code or RFID technologies. Information in traditional bar codes is stored as a sequence of black and white bars varying in width, which when read by laser is translated into a digital sequence, which according to fixed rules can be converted into a decimal number or other data. Sometimes information in a bar code can be transmitted through radio frequency, more typically radio transmission is used in RFID tags. An RFID tag is card containing a memory chip and an antenna which transmits signals to a reader. RFID may be found on merchandise, animals, vehicles and people as well. ↑ Oxford Dictionaries. Retrieved 21 February 2012. ↑ Mallik, Susan (2010). "Customer Service in Supply Chain Management". In Hossein Bidgoil. The Handbook of Technology Management: Supply Chain Management, Marketing and Advertising, and Global Management, vol 2 (1 ed.). Hoboken, New Jersey: John Wiley & Sons. p. 104. ISBN 978-0-470-24948-2. ↑ John T. Phelan, Jr. P.E. "Guest Column: Knowing When a WMS or WCS Is Right for Your Company". Supply & Demand Chain Executive. Enom, Inc. Retrieved 15 September 2009. ↑ Baziotopoulos (2008). "An Investigation of Logistics Outsourcing Practices In the Greek Manufacturing Sector". PhD thesis. 1 2 Raue, J.S. & Wieland, A. (2015), The interplay of different types of governance in horizontal cooperations: a view on logistics service providers. The International Journal of Logistics Management, Vol. 26, No. 2. ↑ "International Association of Public Health Logisticians".